Occasionally the man in the relationship is shy or embarrassed about having their picture taken. It might take some coaxing to get them out of their shell. Not the case with Brian. You can just tell how much love he has for Amy. They are sooo sweet, I can't wait to shoot their wedding. Amy is also participating in "Race for the Cure" which can be found here www.phillyraceforthecure.org. She also never liked New Kids on the Block. Smart cookie. I loved, loved, loved shooting this wedding. Courtney was so much fun! 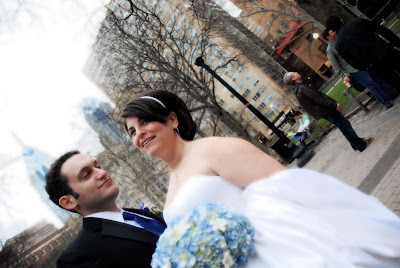 The wedding was at the Warwick on 17th and Locust so we slipped off to Rittenhouse Park to shoot for a bit.